Owning a home comes with a great deal of responsibility. From routine repairs to complex home improvement projects, the tasks seem never ending and can leave you feeling overwhelmed. When you simply don't have the time or inclination, Sears Handyman Services can lend a hand. 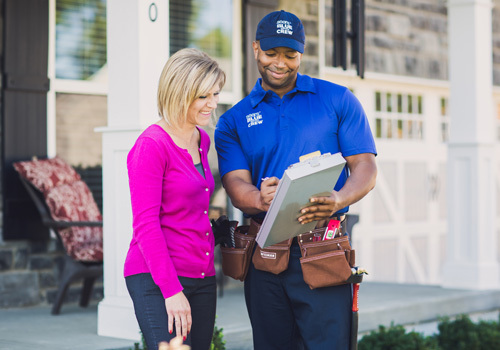 Our knowledgeable staff at Sears Handyman Services can assist in a variety of home repair and building projects, especially when the job is beyond your comfort level. Our handymen are no strangers to regular maintenance, home improvement, or remodeling. Sears Handyman Technicians are skilled in various areas, from your most basic to intermediate needs. Give us a call at (516) 408-5500. When an electrical project is just beyond your reach, contact Sears Handyman Services for a skilled technician. Our handymen are well versed in repairing light fixtures and ceiling fans, installing various forms of lighting like LED and recessed, and a host of other electrical needs. Contact us for a full list of our services. Along with everyday wear and tear come the minor holes and scratches on a home's interior, which is primarily made up of drywall. Stop staring at that hole in the corner of the bathroom or bedroom and call Sears Handyman Services. We're happy to help repair, tape, and patch those unsightly eyesores. Our technicians can also hang drywall to facilitate structural changes to your home. Nothing completes a backyard like a beautiful deck. Decks require yearly maintenance to ensure their protection from the elements and so they don't fall into disrepair. Our handymen can repair your existing deck which can suffer from wood rot and general weathering. We can also build the perfect deck for your home, along with providing the perfect stain and water treatment. Contact us today for more information. Just like a backyard deck, the fence surrounding your property makes a statement about your home. Sears Handyman Services can install a new fence or repair an existing one, on your schedule, and within your budget. We specialize in chain link, privacy, and picket fences. Contact us for a full line of our fencing services. Painting can be a tedious chore that most of us tend to put off until the last possible minute, but it's the easiest way to beautify your home. Our technicians can remove existing wallpaper, paint hard-to-reach surfaces, such as cathedral ceilings, and paint the interior or exterior of your home. Call us today and have your home revitalized in no time.